On the 19 of August, NDTV and their partner group Vedanta announced the launch of their ‘Our girls Our pride’ campaign with Priyanka Chopra as the campaign ambassador. This happened on a day when Vedanta suffered a huge blow to its mining operations in Odisha. The launch of this initiative comes at a time when the whole world is witnessing the great triumph of the Indigenous and Tribal communities of Odisha, who by rejecting Vedanta’s bauxite mining operations have set an unprecedented example for the rights and sovereignty of all Indigenous peoples around the world. This victory is not just of the Dongaria Kond and of other surrounding communities of Niyamgiri, but a victory of all Indigenous peoples around the world and their right to self-determination. The operations of Vedanta, have been consistently called into question by many communities, environmentalists and human rights activists. 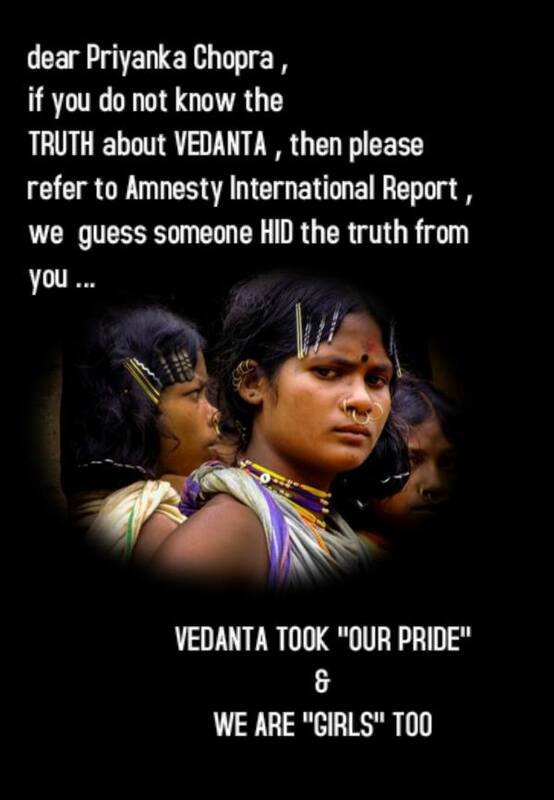 By launching this campaign along with NDTV, Vedanta is attempting to do what could only be described as damage control in the guise of ‘corporate social responsibility’. Vedanta recently suffered a unanimous defeat by all the 12 gram sabhas (village council meetings) which took part in this ground breaking decision. Now the mining company appears to be using this campaign for PR purposes, for ‘brand recognition and awareness’. By using this opportunity as a means to improve its damaged reputation, Vedanta intends to create a positive image of its company to further its vested interests. This campaign claims to bring issues of girls’ education, health, nutrition, foeticide and infanticide into light. It is ironic to say the least that the same Vedanta which is claiming to spread awareness about issues related to girl child would have otherwise displaced or pushed into poverty many of these girls and their families or exploited their labour in exchange for cheap wages in its mining operations. Vedanta’s co-partner, NDTV, a major broadcasting television network, by partnering with such a company, globally held in question for its violation of environmental and human rights, is further strengthening the corporate-media nexus where each profits from the other. Also noteworthy in this campaign is the choice of Priyanka Chopra as the campaign ambassador. Chopra was earlier seen featuring in the advertisement of the ‘Ponds White Beauty’ product. This product which promotes the idea of whiteness as beauty, fairness as norm. The message of the ad was quite clear, that being dark is not beautiful, it is to be done away with. The Bollywood actress associated herself with a product that went further in trying to create a ‘niche’ among its many competitors that rule the not-so-fair Indian fairness market. The product claimed to achieve something, which hadn’t been done before. It did not just promise ‘glow’ (read whiteness), but, ‘pinking glow’. This in a nation so obsessed with the idea of ‘fair’ skin where the sales of whitening products far outstrip those of Coca-Cola and tea, according to one market research firm’s report. This in a nation where the market of fairness products was worth over US$400 million in 2010, according to a report by AC Nielsen, a market which is growing at 18% per year. Questions then need to be asked about what ‘pride’ this campaign claims to bring. How just is it ethically, morally and politically to have a campaign on an issue of crucial significance being run and promoted by social actors whose very actions damage the standing of the girls in our society. Ask Priyanka Chopra to withdraw as ambassador of Our Girls Our pride Now !! Ask NDTV to stop sleeping with Enemy Vedanta Now ! !